We had to do quite a bit of traveling this summer (plane, car, boat… you name it) and we were trying to find something that would keep our 8-year old daughter busy for at least part of that time. One thing that she loves to do is draw and paint, so were looking for something that she could hold her crafts supplies in while we were traveling. Lo and behold, we came across the ALEX Toys Car Valet. The kit measures 14 inches by 12 inches by 3 inches, comes with two removable crayon/pencil pockets at the top of the valet, two nylon mesh open pockets for storing things that your son or daughter needs quicker access to and a larger plastic pocket for putting drawings and paper in. The whole kit zips up into a neat and fairly compact travel case. At first we were a bit worried because it is advertised as a “car” valet and we needed something that could handle all sorts of different traveling. However, after seeing our daughter use it all summer long, we can honestly say that it’s been one of the best purchases we’ve made in a while. It’s not perfect, but it definitely suited our traveling needs. If you want to find out more on its pros and cons, keep on reading. I’m going to start with the pros and the first thing on our list is the removable pockets. They are great in our opinion. 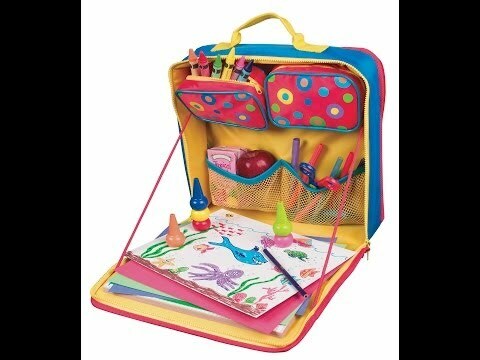 The zippers are sturdy enough and the fact that you can close them is a must when storing a ton of crayons and pencils. (Avoids you having the pick them off the ground when you open the valet.). Another thing we were sort of worried about was how sturdy the “work table” would be once you hand the valet. Not a problem at all. Our daughter did not have any problems at all with drawing on it and doing other crafts. Another nice feature is that the whole valet is made of soft bendable plastic which is safer for traveling. The whole thing zips up nicely and the handle makes it a lot easier to carry around. Now for the suggested improvements. I’ll start with the net pockets. Although they are handy to take things out in a hurry, and they can hold bigger items (e.g. : scissors, juice box, apple, etc. ), we noticed that they stretched a bit after a few months of use. The velcro straps are great for attaching the valet to the car seat in front however that isn’t always possible in a plane depending on the type of seat/headrest you are attaching it to. (I’m not sure we can consider this a “con” since this is advertised as a “car” valet, however I thought I’d point it out anyways).